We have three new little turtles in the pond in our yard. It has taken a month or so for us to train the little ones to come to the surface (not swim away) and eat the food we throw on top of the water. The real trick is to encourage them to eat the TURTLE food, not the fish food we distribute for the school of fish which shares their pond. I suppose they might get nourishment from the fish food, but I know the turtle food is healthier for them in the long run. It makes me think of beginning a school year with a new group of children. We carefully need to teach them to come to the surface to eat the right food. Of course, the teacher or caregiver must provide the right food. Sometimes that doesn't happen. Just like the little turtles, I suppose children may get some benefit out of inappropriate practices in the classroom. But, when teachers use appropriate teaching strategies, it is much more nourishing and beneficial for the child's entire life. I hope we early childhood educators will do our best to provide turtle food to help growth and development. We went from a long wet, cool spring (unusual for us) to a blistering hot summer this month! We were trying to enjoy a family birthday barbecue this past Saturday (it was 102!) and one of my grandchildren reminded me that when it is hot outside there is always ice cream (she wishes). That reminds me of the promises of life. When I graduate from college I can... When I finish this school year, I can rejuvenate... When I train him out of diapers, I can... Lots of expectations when certain journeys seem complete. I think we adults tend to concentrate on the end reward without enjoying the journey. However, it may help us weather the journey. I was complaining about the cold and rain in June, so I should enjoy my 102! On the flip side of this issue are the children. Not knowing what the end result will be, they are alive in the moment. I was discussing inappropriate classrooms last week with my class. I was struck by how uncomfortable some teachers make classroom settings. Since children don't seem to worry about the end result (I can be free of this mean teacher at the end of the year...) they are stuck in the moment. It makes me very sad for the children in classrooms that are always so negative. I would assume it is a feeling of being trapped in a cage. Their situation is much more uncomfortable than 102. I wish I could find all those children and give them ice cream. I was reminded recently about how there seems to be opposition in all things. 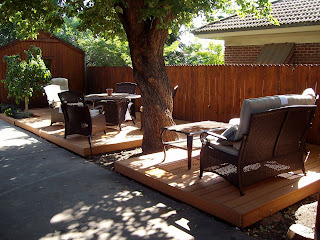 We built a deck last summer underneath a very large and very old apricot tree. As much as I like apricots, I was wishing the blossoms would freeze this spring (which many of them did when it was 29!). The reason for my desire was that there can be so many apricots on that tree and they drop to the ground for several weeks. Our back yard smells like a winery. Also, I didn't want them falling on my new deck. The glorious shade provided by the tree is compromised during July because you might be fielding apricots when you are sitting underneath. We talked in our Cognition and Creativity class this week about standardized tests. While they are usually inappropriate for early childhood, there is place for them at the table in later years. They do provide a framework and norm for learning the core curriculum. Unfortunately, they can be used as a single indicator of a child's learning. In the early education field we know that multiple measures must be used to monitor a child's progress and development. Just like the tree, the shade and the deck provide a great escape during the summer (basic information provided by standardized assessments), sometimes we get hit with apricots (major decisions made solely on standardized test scores).